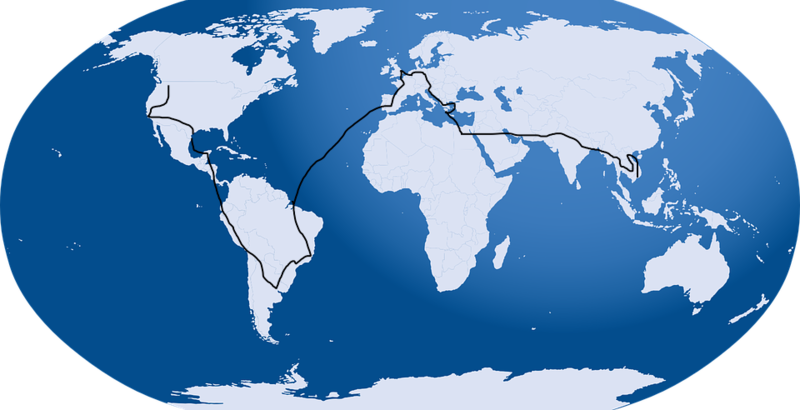 Our world tour has taken us to countless fun, amazing, awe-inspiring places. We’ve gazed upon the Great Pyramids, Machu Picchu, the Taj Mahal, and numerous others. We have truly seen the heights to which mankind can create beauty. We have also seen evidence of humanity’s darkest and most depraved conduct. This post details the latter. As a forewarning, parts of this post might be tough to read. In order to remain true to the facts, I have to describe some disturbing things. Cambodia is home to the UNESCO World Heritage Site of Angkor Wat. While the temples and other complexes amazed Emily and I, what stuck most with me in Cambodia was our tour of the Killing Fields and S21. Briefly, from 1974 to 1979, Cambodia came under the control of a communist dictatorship, called the Khmer Rouge. They undertook policies of mass resettlement, torture, and genocide. To put things into perspective, at the time the Khmer Rouge took power, Cambodia had around 8 million citizens. By 1979, the government had either directly or indirectly killed 2 million of them. An entire quarter of a country’s population had been killed. Imagine that your government killed one out of every four people you knew. Cambodians lived it. A fundamental tenet of the Khmer Rouge’s domestic policy consisted of the implementation of “Year Zero.” Essentially, they intended to wipe out Cambodia’s present culture, customs, and society- and start over. 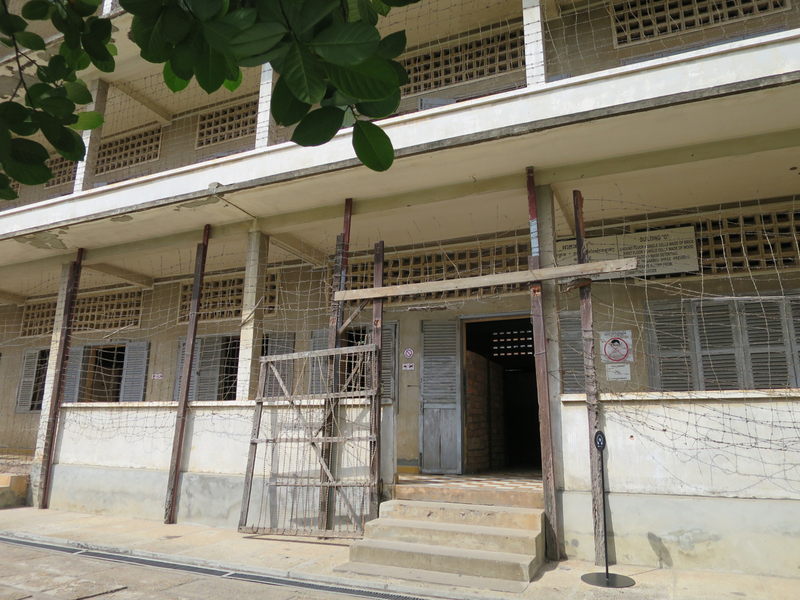 Arriving in Phnom Penh, Cambodia’s capital city, we arranged a tour of the “Tuol Sleng” (also known as S21) Prison and the “Choeung Ek” Killing fields. The S21 compound had previously been a high school. When the Khmer Rouge took over, they forced the evacuation of the entire city of Phnom Penh, (a population of ~2-3 million) in a death march. They converted this high school into a torture prison. Government authorities arrested people for wearing glasses (they believed only intellectuals wore glasses, and intellectuals were a threat), or for having too soft of hands (rough hands meant you worked the fields, soft hands meant you were an intellectual). They arrested, tortured, and murdered anyone with a professional position: teachers, lawyers, doctors, and engineers. 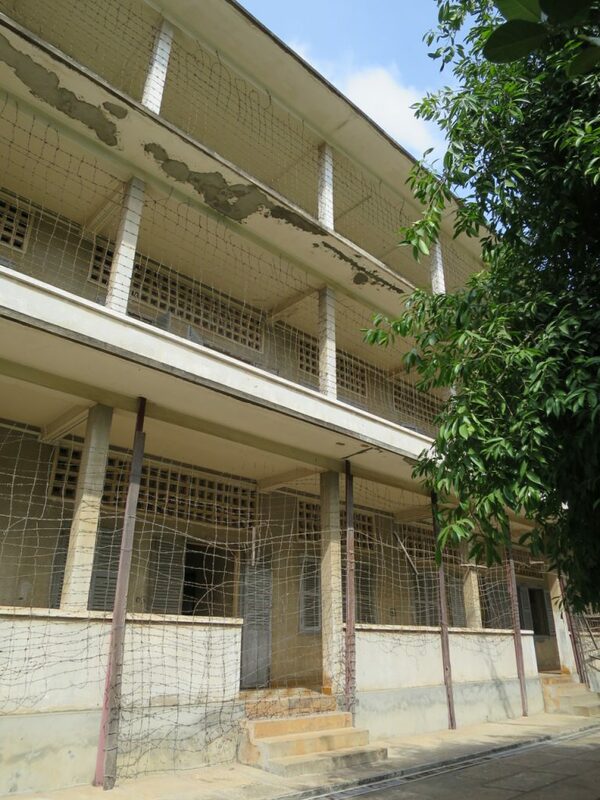 In the Khmer Rouge government, arrest alone constituted sufficient proof of guilt. The guards at S21 relentlessly tortured the inmates. Guards employed beatings, electrocutions, forced coprophagia, water boarding, and much worse to illicit coerced confessions. Illiterate peasants “confessed” to being high-ranking CIA agents operating in Cambodia. Once the guards had a “confession,” the government could execute them. Of the ~20,000 inmates of S21, only 7 are known to have survived. S21 is now a museum, and a sobering reminder of the atrocities committed by the communist regime. Walking through the complex, one can still find the water boarding device, inmate’s scratches on the walls, and blood on the floor. That’s how recent this happened. You can still see blood on the floors. I felt sick for most of our time spent at S21. The second and third floors served as prisoner’s cells. The guards used the first floor exclusively for torture. On the way out of S21, one of the known survivors of the complex stood near the exit gate. Chum Mey suffered in S21 for two years. The guards spared his life when they learned he had the skills to repair a typewriter. It’s a strange, surreal experience indeed to stand in a man’s cell, where he was chained and tortured for weeks or months on end, and then walk outside and meet him. Our Tuk Tuk then hauled us 17 kilometers (11 mi) south to the Choeung Ek Killing Fields. Upon entry, the groundskeepers warn you to watch where you step, as they are still finding bones and other human remains on the ground. After a heavy rain, bones will surface. Tree roots bring up tattered clothing and even more bones. Thus dutifully warned, we headed into the fields proper. A 62 meter (203 foot) high Stupa, filled with the remains of 5,000 victims towers above the surrounding fields. A guided audio tour led us from horrifying site to horrifying site. The Stupa has level after level of human skulls- most displaying a hole in the back from a pickaxe. The Khmer Rouge had economic restrictions that prevented them from conducting executions with bullets, and thus they relied on pick axes, shovels, hammers, and even the sharp spines of tree leaves to murder their victims. An estimated 10,000 people met their death here. 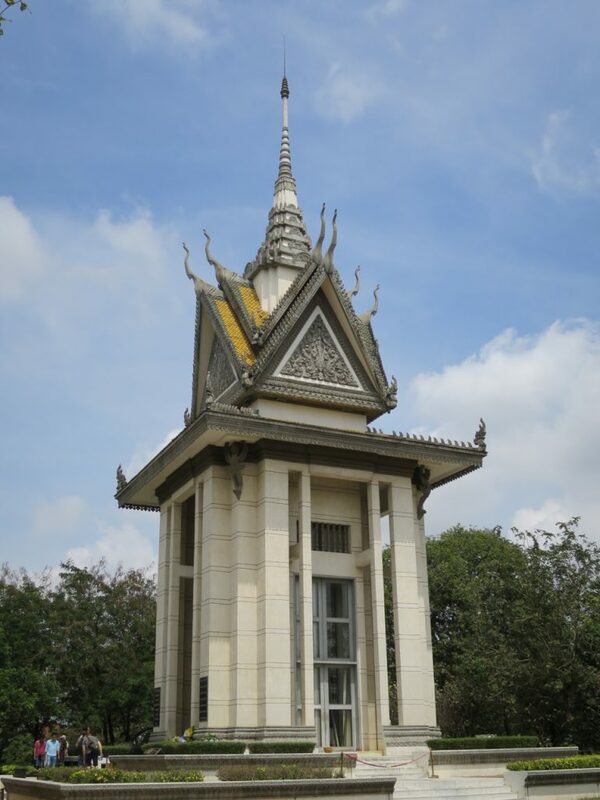 This is one of many killing fields in Cambodia. Most horrifyingly, the Khmer Rouge had a policy of killing the entire families of those given the death penalty. 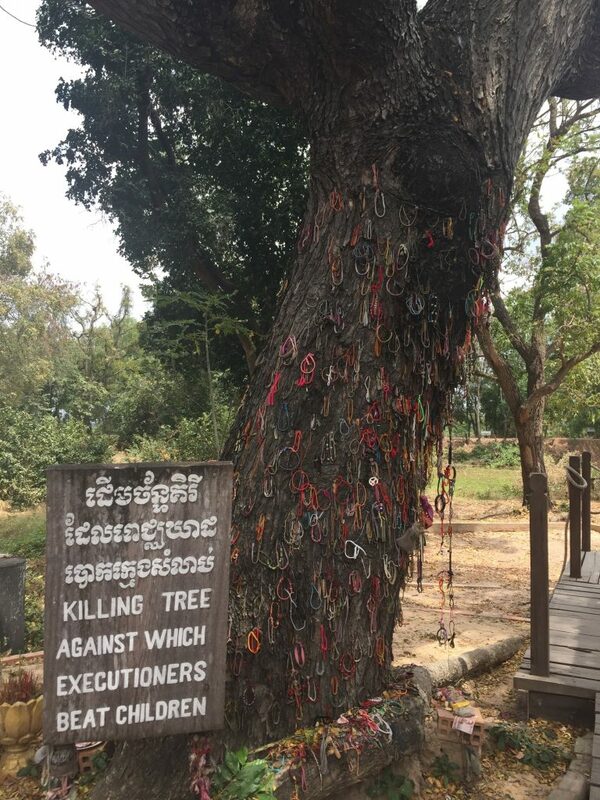 They had a saying, “To stop the weeds, you must also pull up their roots.” A small memorial sits below a large tree, along with a hand-painted placard that reads “Killing Tree.” On this tree, Khmer Rouge executioners took infants and toddlers from their mothers and swung the children by their feet, head first into the tree, killing them. Then they murdered the mothers. I had to sit down. On my way to a nearby bench, I looked to my left and saw a shin bone sticking up from the ground. I looked further and saw a tattered pair of children’s pants half unburied. We slowly made our way through the rest of the field before stopping at the Stupa to pay our respects. On our way out of S21, I stopped to listen to the survivor Chum Mey speak through a translator. He told a small group of us that we are now part of the collective memory of S21 and the Khmer Rouge. As part of the collective memory, we have a certain responsibility. Chum Mey looked at me when he told us that we had a duty to tell the world of what we saw, and to warn the world of the possibility of genocide. Consider this post a partial fulfillment of that obligation. Reading this post, you are now a part of this collective memory. We have an obligation to remember these unforgivable acts, tell the world of them, and do whatever we can to prevent the next genocide. No country is immune from tyranny, oppression, or genocide. Whenever you start to think, “it can’t happen in my country,” remember that it has happened in Russia, Germany, Cambodia, Rwanda, Turkey and more. As part of the collective memory of S21 and the Khmer Rouge, I’ll hope you keep this in mind the next time your government proposes banning an entire class of people, or implementing water boarding, or suspending due process for “undesirables.” Genocide can happen where you live. Don’t let it.